Newly appointed US Defense Secretary James Mattis arrived in South Korea on Thursday to start his Asia tour, which includes a stopover in Japan on Friday, in a bid to reaffirm US alliances with the two Asian countries. North Korea's nuclear issue is expected to be placed at the top of his agenda and Mattis is likely to use this issue to gain leverage for the US to contain China and take a dominant role in Asia-Pacific security. The presidency of Donald Trump has created a great deal of uncertainties in global politics, economy and security. As his rhetoric on the South China Sea disputes and the Taiwan question intensifies, the possibilities that the Korean Peninsula will be thrown into a war are rising. We used to believe that the South China Sea is the very region where military clashes between Beijing and Washington will occur. But the Korean Peninsula could more likely be where the US could gain the upper hand over China. The US can grasp the most benefits with minimal input. Compared with the other areas of instability in China's peripheral regions, the peninsula has the exact condition for a war to break out and the situation may spiral out of China's control. Trump's presidency has heightened this possibility. Although Trump's strategy on the peninsula is still unclear, he apparently wants the US to benefit from Asia. The more chaotic the region is, the more dominant the US will become. That the US takes the initiative to launch military actions against North Korea is in line with Trump's "America first" doctrine. Given his direct style, it would not be in Japan and South Korea's best interest to raise objections even though they have their own national interests to consider. Trump will not tolerate North Korea possessing missiles capable of reaching the US. But if Pyongyang proceeds to develop nuclear weapons, it will only be a matter of time before they succeed in making the missiles. During his New Year's speech, North Korean leader Kim Jong-un said the country had reached the final stage of preparations for launching an intercontinental ballistic missile. But, will the US intercept North Korea's missile tests? Will it adopt surgical strikes? How will North Korea fight back? The US maintains great advantages in military deployment in East Asia and it is always ready to launch a regional strike. Once Trump chooses to be tough in the peninsula, a strike is highly likely. Apparently North Korea will not give in to the US' military menace. It will only consolidate North Korea's sense of insecurity and propel the country to initiate an end game. More importantly, no one knows what Kim wants and what he would do under an aggressive US. Once such a strike takes place, China will face difficult choices. No matter how far the war will extend, it will restrain China's development both within and beyond its borders, including the South China Sea disputes and the Taiwan question. There is also the possibility that Washington and Pyongyang will start negotiating after a head-on confrontation. Even so, China will be affected. If the two reach an agreement, China's role in restructuring the security pattern in the peninsula will be weakened. The US still holds an advantageous position in the peninsula issue. It not only has military advantages, but also offshore advantages, which means the US can control the situation from a distance while not being directly affected. This puts the US in a powerful position in determining the development of East Asia. Trump will definitely use this to his advantage. So far, East Asian countries, in hope to avoid wars, are counting on the strategic rationality of all the countries involved. 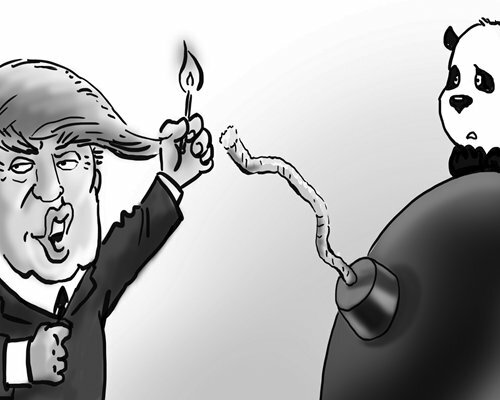 It is uncertain whether North Korea will be rational in the future. Now with Trump taking office, the US is becoming more irrational. We do not know what Trump will do next, but we should be prepared for anything.